(PPÖ/Vienna) – “Give me oil in my lamp, give me peace in my heart” were the words a congregation of nearly thousand Scouts and Guides from more than twenty associations across Europe and from overseas sang when their representatives prepared their lanterns to receive the ORF Peace Light (ORF Friedenslicht) last Saturday during a touching ecumenical ceremony in Vienna, Austria. Now, when you read these lines, and thanks to many more Scouts and Guides, the Light will have found its way to all corners of Europe, to capital cities, small villages, farms and villas, bringing with it its message of peace, hope, tolerance and warmth. “It all began in 1986”, recalls Bertl Grünwald, one of the initiators with the Pfadfinder und Pfadfinderinnen Österreichs (PPÖ, Scouts and Guides of Austria), “when the Upper Austrian Studios of the Austrian Broadcasting Corporation (ORF Landesstudio Oberösterreich) had the idea of sending a youngster to Bethlehem (the so-called ‘Friedenlichtkind’) to light a lantern in the Church of Nativity and to share it during a ceremony in the framework of the ‘Light into Darkness’ campaign (‘Licht ins Dunkel’) organised by ORF each December. Then came 1989 and with it the downfall of a number of communist regimes in Eastern Europe and quickly it was decided to carry a Peace Light to these countries.” And since 1989 the PPÖ are active partners. Ever since, they have played their role as true Messengers of Peace and brought a little warmth, hope and joy to their families, friends, colleagues and neighbours. 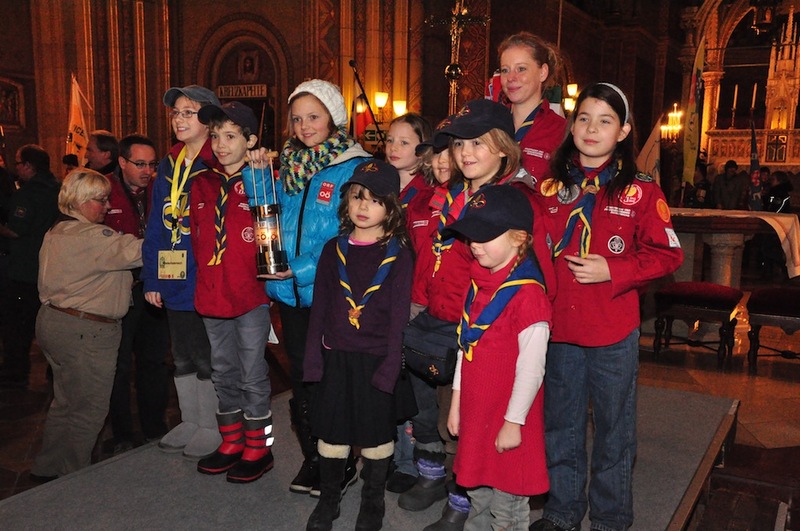 Each year other Scout and Guide associations joined in and helped spread the Light further around Europe and to other continents. “It was very moving to receive the little flame from Christina, the ‘Friedenslichtkind’, who had brought it to Austria”, adds Phillip, a member of PPÖ’s Scout and Guide Youth Council (PPÖ Bundesjugendrat), who was called forward to have the lantern of his fellow Salzburg Scouts and Guides (Landesverband Salzburg) lit. The little Peace Light – small and fragile but at the same time strong and resistant – is a strong symbol as it carries its messages to the farthest corners of our world. And over the next days, many Scout and Guide associations across Europe and overseas will be organising similar ceremonies in their countries to help spread the message of peace, tolerance, warmth and hope further – from Portugal to Latvia, and from Mexico to Romania, to name just a few. 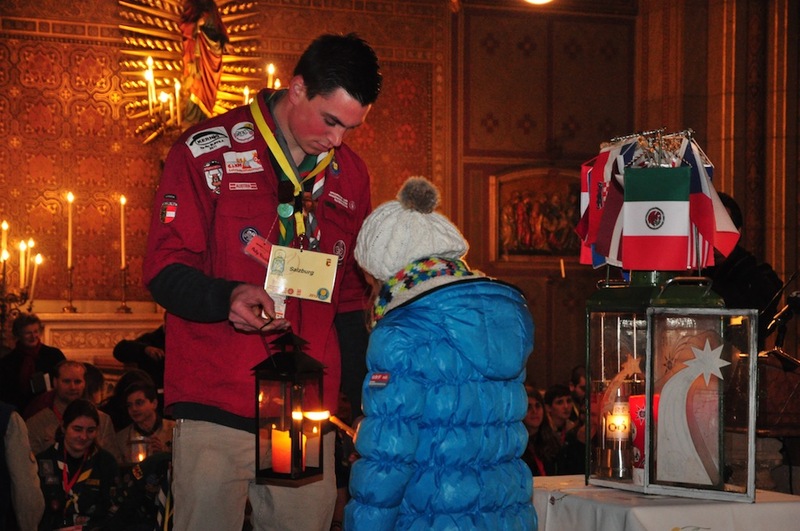 So, check with the Scout or Guide Group in your home town to find out where you can light your own lantern! Official images from the Peace Light Ceremony in Vienna in December 2012. Background information about the project on the website of PPÖ. Details about “Das Friedenslicht” and “Licht ins Dunkel” on the website of ORF, the Austrian Broadcasting Corporation.